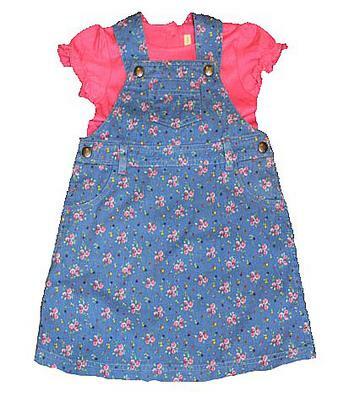 Overall dresses are absolutely adorable on little girls. The blue with pink, yellow and green flower print overall dress has snaps on the shoulders to get over a childs head easily and snaps on the side to make more room if needed. There is two side pockets and a center pocket on the front and a criss cross back. The matching pink t-shirt has ruffles on the sleeves and buttons on the back to get on/off easily. This adorable outfit is 100% cotton.